So this year I thought that I could take a shortcut through the Land of Main Ideas. My idea of a shortcut was one quick lesson, authentic note-taking about Antarctica, create our own main ideas, and emerge with full mastery. So, trying to teach main ideas in one lesson was not a good idea. Next we looked at some paragraphs and found topics and main ideas with the help of a PowerPoint. (You can find it here.) I really like using PowerPoint to illuminate text and show students key ideas. In this particular example, notice how the PowerPoint makes the topic of the paragraph jump right out at students. And for teachers who are sure that their students have already mastered this, I challenge you to give it a try. You may be surprised at how far students can get without having a true grasp on topics. I wrote a book about it and for some reason I still find it shocking, every year. Maybe you will learn a little faster than I have. Instead of jumping right into having students identify main ideas, I showed them several paragraphs that had the main idea underlined. Then I challenged them to make a generalization about where the main idea can be found in a paragraph. If you know fourth graders, you know that making generalizations about text can be tough for them. Many tried to answer with information about the wood thrush, confusing the text at hand with the abstract idea of text. If this happens to you (and it probably will), just remember that it takes students time and practice to talk about texts in the abstract. But every new experience adds to their background knowledge for next time. You may notice that these examples are usually about animals, and that there are multiple paragraphs about one topic. My students love animals and are always motivated to read about local creatures they may see. Using real topics instead of the "fluffy" topics that proliferate in worksheets keeps our work with main idea from devolving back into the worksheets or color-coded SRA cards of yesteryear. I always end the lessons with a video or photo (sometimes from my own personal collection!) of the animals in the paragraphs. Our next step was to jump into creating main ideas for texts with implied main ideas. Fourth graders really struggle with these tasks, but they are so important. In fact, I think that creating a main idea sentence for a set of given details is one of the most important skills for students to develop. This is a lifelong skill that transcends reading and writing. Looking at paragraphs with implied main ideas and talking about what the main idea could be helps students to consider the gist of a set of sentences. In this paragraph, notice how all of the sentences relate to the movement of the fairy shrimp. Movement and other abstract nouns are vital for academic reading and writing, but not frequently used in speaking. Exposure and practice help students to weave these kinds of words into their writing. Our next step was to write a topic sentence for a paragraph. Yes, it's test preparation, but it is worthwhile. Students really need to be able to do this! Strong readers will breeze right through an activity like this, especially as the pictured example has such a transparent main idea. However, struggling readers will have difficulty. They may write a topic sentence that relates only to one kind of skink. Circling the different kinds of skinks in the paragraph is a way to scaffold their learning. I'm not talking about student understanding here--I'm talking about my own. What did I learn from my longer-than-expected-journey through the Land of Main Ideas? -Helping students to identify and generate main ideas is vitally important and may take more time than expected. -Practice with finding topics and main ideas is worthwhile work, and I can keep it from just being boring worksheet practice by incorporating topics of interest and real-life links. 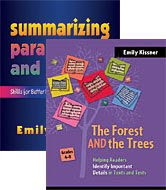 -Even strong readers may need explicit lessons with topics and main ideas--and that's okay. In between blogging, writing, playing around outdoors, and spending time with my family, I also run our school's Student Council. Things get crazy! I imagine that there are probably many others who have found themselves in the same situation--running Student Council, but without much extra time to give to such an undertaking. I've learned that it is helpful to have a set schedule for the year. Repeated projects give a shape to our school year. They also help me--I am always short on time, and having a standard schedule means that most of the prep work can be saved from year to year. Several years ago we were looking for a fun spring event that would engage students after standardized testing. My oldest son suggested Peeps dioramas after we spent time looking at the Washington Post galleries together. What a perfect idea! We don't do dioramas for school projects much anymore, but kids are just naturally attracted to creating miniature worlds. And it's been a great success. Each year we've had more than 40 entries, which is an amazing showing for our school of less than 200. As students bring in their dioramas, our fabulous custodian arranges them in the cafeteria. I can always tell when a particularly impressive diorama has come in--the students are buzzing as they come in from breakfast. "Did you see...." "Mrs. Kissner, you have to go to the cafeteria right now!" Some dioramas are obviously completely kid-made, while others look like they have become family projects. Kids talk about working with their moms and dads or even grandparents to bring their ideas to life. This year, the end of the contest will coincide with our Parent Breakfast. It may make the serving a little trickier, but it will be fun to show off all of the dioramas. We end the day with a brief awards ceremony in the gym and the presentation of The Golden Peep. So, if you're embroiled in a thousand crazy schemes (like me), you may want to consider giving Peeps dioramas a try. After all, what's the harm in one more crazy scheme? In my last post, I wrote about scaffolding students to observe from videos. My goal was to help students do firsthand observations of faraway animals. After all, they can't observe leopard seals in the classroom--but they can use videos to observe animals from far away. 2. Why is the leopard seal swimming so close to the diver? After our first viewing, students settled down to observe, using the observation sheet I had created for them. Interestingly, it became a vocabulary-rich conversation as students tried to find the best words to describe what they were seeing. Is the leopard seal gray? Are those called fins or flippers? How could we describe the leopard seal's shape? One student introduced the word porpoising, a word that he had learned from reading about penguins. Could we say that the leopard seal is curious? I was especially happy to hear that just giving students an observation form could change the nature of their discussion, prompting them to use more specific language. 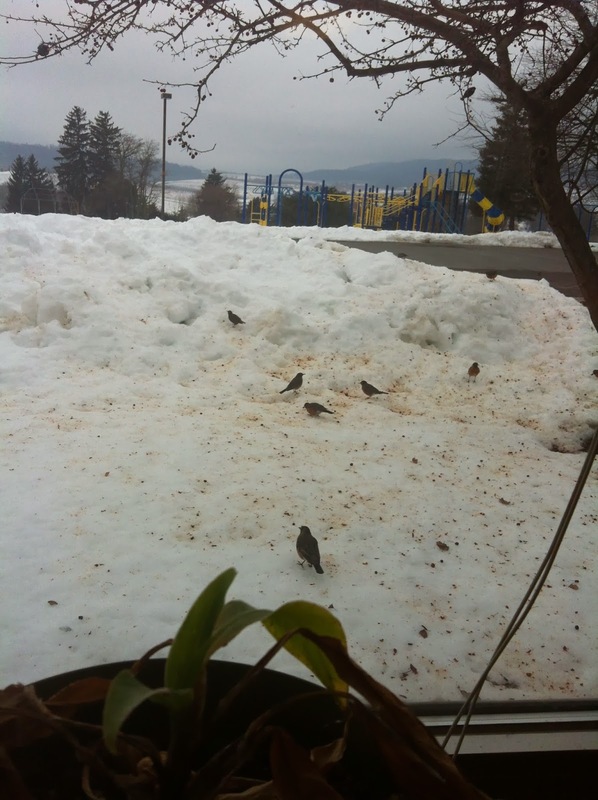 The conversations transferred over to students' observation of the birds outside our window! "I think he's territorial," was one student's comment. The class then moved into research mode. Some students used print resources to find more information about people and places of Antarctica; others watched videos in small groups; and others asked me to track down good links for them. It turned into a peaceful and productive time with students scattered about the room and totally engaged in learning more. -I did some very small updates to Introduction to Text Structure this weekend. I tend to fall out of love with what I have written very quickly, but the texts in this packet are still some of my favorites ever. As a teacher, I just love having five texts on the same topic with different text structures. -I added two new iPad activities to Frolyc this weekend: Daylight Savings Time, which introduces a point/counterpoint style of persuasive writing, and Build a Butterfly Garden, which includes a persuasive text and an informational video. Both are good for teaching author's purpose and supporting positions. When I started using Antarctica as a theme for teaching nonfiction back in 2008, I used mostly print resources. I had a sometimes-functioning LCD projector, no Internet access to the LCD (the cord wasn't long enough! ), and limited computer lab access. So much has changed. This year, half of those print resources that I so carefully accumulated in 2008-2010 ended up staying in the box. It's not that I'm against print resources--it's just that I can be much more selective now that I have so many digital resources at hand. How to scaffold students to use these digital resources? I decided to start by watching students as they engaged with videos on their own. What were they doing? What were they noticing? -Lots of talk: Watching videos does get students engaged in talking. Many students would cluster around a laptop to watch a video--"Look at that!" "Ew!" "What's that animal?" -Not much use of content-specific vocabulary: For all the talking going on, students weren't using much content-specific vocabulary. Listening to their conversations, it was impossible to tell what they were watching or what they were learning from it. Their comments were mostly reactions, not elaborations or statements. My time watching the students helped me to consider what my next steps would be. How could I help students to watch video purposefully? The availability of firsthand video means that students learning about a remote location don't have to depend on other people's words or generalizations--they can view video and create their own ideas. But this kind of purposeful watching doesn't come naturally to young learners. So what can video do that my text resources cannot? Extended, minimally produced animal videos are my favorite video resources. They are a great use of technology because these videos give students an experience that they would not otherwise have. It will be interesting to see what students do with this. Will their conversations change? Will they be able to weave details gleaned from a video into their writing? Will they be able to create their own observation forms? I'm also interested in seeing if students consider the sources of the videos. How was the footage obtained? Is this typical of the animal? This kind of learning will be essential for our students as they encounter more and more video resources. Several years ago, I started using Antarctica as a topic for our initial nonfiction unit. Why? I'm not really sure. I was probably influenced by the lovely Antarctica map included in Toolkit Texts, and also by Graham Nuthall's analysis of how students remembered information about Antarctica. But it has had a snowball effect. Over the years I've gathered more and more information about Antarctica, put together more resources for students, and watched as they learned about topics, main ideas, and details in the context of learning about Antarctica. Now that I am in the middle of it, I'm convinced that this is a wonderful topic for a shared inquiry project in the classroom. What's the standard research topic for elementary school? Animals. And a study of Antarctica can lead to the study of many fascinating animals, like chinstrap penguins, orcas, and leopard seals. For some of my students, another animal research project gives them the chance to consolidate what they have previously learned and become more confident with their research and writing skills. But there are other topics that students can choose to pursue, like icebergs, the United States research stations, explorers of the past, jobs that people can have, and different research projects. These different topics offer a huge range of difficulty, making it easy for me to provide resources appropriate for different levels. To me, this is the most interesting part of studying Antarctica. There are research projects going on right now. Many of these scientists post updates on blogs, post videos, and share their information frequently. Students can find up to date information and see the power of science in action. Plus, the topic keeps me learning and guessing--I like to see the updates of what's happening this austral summer! Beyond Penguins and Polar Bears: This site is called "an online magazine" and it includes printable and electronic books about different topics related to the poles. Weddell Seal Science: Detailed information about an ongoing seal research study. Check out their YouTube channel for beautiful videos. United States Antarctic Program: Educational resources from the USAP. MVFram: This boat takes tourists on trips to Antarctica. Sometimes we stop by the blog to peek at the pictures and see what the expeditions are doing now. PolarTREC: Tons of resources available here. Educational Resources from IceCube: I haven't had much success in trying to explain neutrinos to fourth graders, but they are still intrigued by what goes on at IceCube. My list of links for students: I provide students with a list of links related to various topics they may study. My YouTube playlist: We watch various videos at the beginning or end of class. Most of them are quite short, and used to highlight a particular aspect of a text or get kids thinking of new questions to consider. -I do have some articles about Antarctica included in Description Texts, Compare and Contrast Texts, and Main Ideas and Details. Several other articles that I've written are not currently available in any text sets. If you are interested, write to me at elkissn@yahoo.com. -March Reading packets are available as well--and I finished them before the end of February. It was shocking. My students loved the frog poems!